Are you looking for syllabus of NDA NA examination? 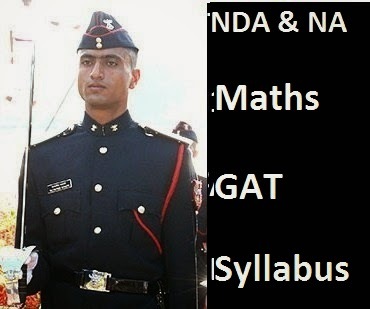 NDA & NA exam consists of Mathematics and General Ability Test. Check out NDA NA exam Mathematics and General Ability test syllabus as prescribed by UPSC here. product, relation, equivalence relation. Representation of real numbers on a line. Complex numbers - basic properties, modulus, argument, cube roots of unity. Binary system of numbers. Conversion of a number in decimal system to binary system and vice-versa. Arithmetic, Geometric and Harmonic progressions. Quadratic equations with real coefficients. Solution of linear inequations of two variables by graphs. Permutation and Combination. Binomial theorem and its applications. Logarithms and their applications. Angles and their measures in degrees and in radians. Trigonometrical ratios. Trigonometric identities Sum and difference formulae. Multiple and Sub-multiple angles. Inverse trigonometric functions. Applications - Height and distance, properties of triangles. Rectangular Cartesian Coordinate system. Distance formula. Equation of a line in various forms. Angle between two lines. Distance of a point from a line. Equation of a circle in standard and in general form. Standard forms of parabola, ellipse and hyperbola. Eccentricity and axis of a conic. Point in a three dimensional space, distance between two points. Direction Cosines and direction ratios. Equation of a plane and a line in various forms. Angle between two lines and angle between two planes. Equation of a sphere. Concept of a real valued function - domain, range and graph of a function. Composite functions, one to one, onto and inverse functions. Notion of limit, Standard limits - examples. Continuity of functions - examples, algebraic operations on continuous functions. Derivative of function at a point, geometrical and physical interpretation of a derivative - applications. Derivatives of sum, product and quotient of functions, derivative of a function with respect to another function, derivative of a composite function. Second order derivatives. Increasing and decreasing functions. Application of derivatives in problems of maxima and minima. Integration as inverse of differentiation, integration by substitution and by parts, standard integrals involving algebraic expressions, trigonometric, exponential and hyperbolic functions. Evaluation of definite integrals - determination of areas of plane regions bounded by curves - applications. Definition of order and degree of a differential equation, formation of a differential equation by examples. General and particular solution of a differential equations, solution of first order and first degree differential equations of various types - examples. Application in problems of growth and decay. cross product of two vectors. Applications- work done by a force and moment of a force and in geometrical problems. Classification of data, Frequency distribution, cumulative frequency distribution - examples. Graphical representation - Histogram, Pie Chart, frequency polygon - examples. Measures of Central tendency - Mean, median and mode. Variance and standard deviation - determination and comparison. Correlation and regression. Random experiment, outcomes and associated sample space, events, mutually exclusive and exhaustive events, impossible and certain events. Union and Intersection of events. Complementary, elementary and composite events. Definition of probability - classical and statistical - examples. Elementary theorems on probability - simple problems. Conditional probability, Bayes’ theorem - simple problems. Random variable as function on a sample space. Binomial distribution, examples of random experiments giving rise to Binominal distribution. The question paper on General Knowledge will broadly cover the subjects : Physics, Chemistry, General Science, Social Studies, Geography and Current Events. The syllabus given below is designed to indicate the scope of these subjects included in this paper. The topics mentioned are not to be regarded as exhaustive and questions on topics of similar nature not specifically mentioned in the syllabus may also be asked. Candidate's answers are expected to show their knowledge and intelligent understanding of the subject. Physical Properties and States of Matter, Mass, Weight, Volume, Density and Spe¬cific Gravity, Principle of Archimedes, Pres¬sure Barometer. Motion of objects, Velocity and Acceleration, Newton's Laws of Motion, Force and Momentum, Parallelogram of Forces, Stability and Equilibrium of bodies, Gravitation, elementary ideas of work, Power and Energy. Effects of Heat, Measurement of temperature. Sound waves and their properties, Simple musical instruments. Rectilinear propagation of Light, Reflection and refraction. Spherical mirrors and Lenses. Human Eye. Natural and Artificial Magnets, Properties of a Magnet, Earth as a Magnet. Static and Current Electricity, conductors and Non-conductors, Ohm’s Law, Simple Electrical Circuits, Heating, Lighting and Magnetic effects of Current, Measurement of Electrical Power, Primary and Secondary Cells, Use of X-Rays. General Principles in the working of the following : Simple Pendulum, Simple Pulleys, Siphon, Levers, Balloon, Pumps, Hydrometer, Pressure Cooker, Thermos Flask, Gramophone, Telegraphs, Telephone, Periscope, Telescope, Microscope, Mariner's Compass; Lightening Conductors, Safety Fuses. Physical and Chemical changes. Elements, Mixtures and Compounds, Symbols, Formulae and simple Chemical Equations, Law of Chemical Combination (excluding problems). Properties of Air and Water. Preparation and Properties of Hydrogen, Oxygen, Nitrogen and Carbondioxide, Oxidation and Reduction. Acids, bases and salts. Carbon - different forms. Fertilizers - Natural and Artificial Material used in the preparation of sub¬stances like soap, Glass, Ink, Paper, Cement, Paints, Safety Matches, and Gun-Powder. Elementary ideas about the Structure of Atom, Atomic, Equivalent and Molecular Weights, Valency. Section ‘C’ (General Science) Difference between the living and non- living. Basis of Life - Cells, Protoplasms and Tissues. Growth and Reproduction in Plants and Animals. Elementary knowledge of Human Body and its important organs. Common Epidemics, their causes and prevention. Food - Source of Energy for man. Constituents of food, Balanced Diet. The Solar System - Meteors and Comets, Eclipses. Achievements of Eminent Scientists. A broad survey of Indian History, with emphasis on Culture and Civilisation. Freedom Movement in India. Elementary study of Indian Constitution and Elementary knowledge of Five Year Plans of India. Panchayati Raj, Co-operatives and Community Development. Bhoodan, Sarvodaya, National Integration and Welfare State, Basic Teachings of Mahatma Gandhi. Forces shaping the modem world; Renaissance, Exploration and Discovery; War of American Independence. French Revolution, Industrial Revolution and Russian Revolution. Impact of Science and Technology on Society. Concept of one World, United Nations, Panchsheel, Democracy. Socialism and Communism. Role of India in the present world. The Earth, its shape and size. Latitudes and Longitudes, Concept of time. International Date Line. Movements of Earth and their effects. Origin of Earth. Rocks and their classification; Weathering - Mechanical and Chemical, Earthquakes and volcanoes. Ocean Currents and Tides Atmosphere and its composition; Temperature and Atmospheric Pressure, Planetary Winds, cyclones and Anti-cyclones; Humidity; Condensation and Precipitation; Types of Climate. Major Natural regions of the World. Regional Geography of India - Climate, Natural vegetation. Mineral and Power re¬sources; location and distribution of agricultural and industrial activities. Important Sea ports and main sea, land and air routes of India. Main items of Imports and Exports of India. Knowledge of Important events that have happened in India in the recent years. Current important world events. Prominent personalities - both Indian and International including those connected with cultural activities and sports. NOTE: Out of maximum marks assigned to part ‘B’ of this paper, questions on Sections ’A’, ‘B’, ‘C, ‘D’, ‘E’ and ‘F’ will carry approximately 25%. 15%, 10%, 20%. 20% and 10% weightages respectively, intelligence and personality test In addition to the interview the candidates will be put to Intelligence Tests both verbal and non-verbal, designed to assess their basic intelligence. They will also be put to Group Tests such as group discussions, group planning, outdoor group tasks, and asked to give brief lectures on specified subjects. All these tests are intended to judge the mental calibre of a candidate. In broad terms, this is really an assessment of not only his intellectual qualities but also his social traits and interests in current affairs.